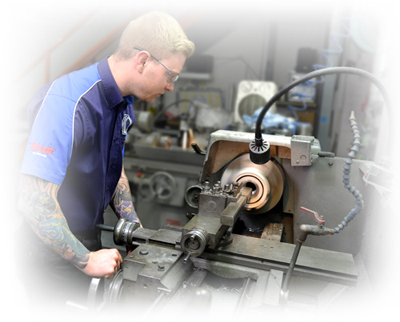 We have a dedicated manufacturing facility in a large 5000 sq ft factory unit which includes full in-house machine shop and precision fabrication facilities allowing us to offer a large variety of turbo machining and fabrication services. Such services include Compressor Cover and Turbine Housing machining, Precision Honing, Precision Grinding, Ported Shroud compressor housing conversions (where applicable), Twin Seal conversions as well as the manufacturing and fitting of Group A and Group N restrictors. We also offer both Mig & Tig welding services for turbo repair works to cast manifolds, turbine and compressor housings. We have in-house facilities for precision honing of turbocharger bearing housings to allow the fitment of oversize bearings if required. We also carry out honing for other turbo remanufacturers. We also have precision grinding facilities and can offer grinding services for turbochargers. The most common conversion here is 'Clipping' or 'Cut back' of the turbine wheel blades. We have the facilities in-house to be able to fabricate small, bespoke turbocharger components to suit most requirements. Examples of these parts include bespoke actuator brackets.